two fully threaded 3/8" x 4 1/2" hex-head bolts, six 3/8" stop nuts, and eight 3/8" washers. 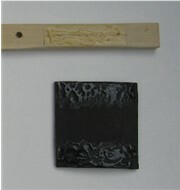 Optional - An effective adhesive for laminating the rubber grips to the wood. Simply taping the ends together will work just as well, if you choose not to laminate them. I used Barge Cement. Important: Always keep track of which 1 x 2 will be on top and which one will be on the bottom. Keep track of which side of each 1 x 2 will face up and which side will face down. Mark them accordingly. This will be important when drilling for and attaching the hardware and rubber grips. 1. Mark both 1 x 2’s where you plan to place your hands, equidistant from the center. Mark the widths all the way around the 1 x 2’s. I made mine 5”. Sand and round the corners in those areas. Because these boards are hardwood, you might want to use a file or some kind of electric sander or drummel tool to cut the edges down a bit before sanding. You don’t want the edges cut in too much, though. Just enough to prevent cutting into your hand. These areas will also be padded. Draw a line down the center of each hand placement area on the side of the board that will have the seam of the rubber grips (caused when you wrap a rubber sheet around the 1 x 2). This line will serve as alignment when you laminate the grips. The seams will be on the top of the upper 1 x 2, and on the bottom of the lower 1 x 2. 2. Center the two clips on the underside of the upper 1 x 2. The seam lines for the rubber grips should be on the top side of the board. 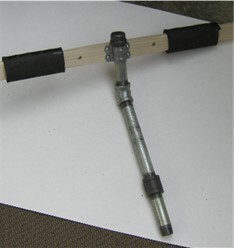 Align the clips so that the pipe will be perpendicular to the board. Mark and drill guide holes for 8 X 5/8 wood screws. It would be a good idea to mark and drill one hole first. screw a clip down with one screw and then mark and drill the other holes. Don't attach the clips and pipes yet. 3. Clamp the two boards together on all four sides. Make sure that hand areas align properly and the four holes drilled for the clips on the upper board are facing inboard, on the underside of the top board, while the seam lines are on top. The seam lines on the bottom board should be underneath, facing downward. Drill two 3/8" holes equidistant from the center 6" to 7" apart, depending upon the width and placement of your hand areas. Once the holes are drilled, this is how the two boards will be put together. If you've ever drilled straight holes in your entire life, now is the time to do it. The holes must be straight and centerd on the boards. I have a device I can attach to my drill to drill straight holes. If you'd feel more comfortable asking someone with the proper tools and skills to do this for you, you might want to consider doing that. 4. Cut four rubber sheets to size for the hand grips. The widths will be whatever you marked on your boards. My grips are 5" wide. Determine how long each sheet should be by wrapping a length tightly around one of the hand areas and marking it. Cut one sheet to that size and wrap it around to make sure it is the proper length. Cut the other three sheets to the same length. My sheets are 5 1/8" long. Coat the sides of one board with cement on the sides with the seam lines. Coat the ends of two of the rubber sheets and allow to set for the required time before proceeding to laminate them. In the meantime, cut ten 3"-4" lengths of electricians tape and have those ready to go, taping the ends lightly to the edge of your work surface. Note: If you choose to simply tape the ends together instead of gluing, that works. I just personally like the idea of a finished product. 5. Set the board on the edge of a surface, align one of the rubber sheets with one of the seam lines and press down. Wrap the other end of the sheet under and around the board and press down on it, adjoining the two ends. Using 5 pieces of electricians tape, draw the edges of the rubber sheet together and tape to hold in place while the cement sets completely. Attach the other rubber sheet to the other side in the same manner. Repeat the same procedure for the other board. 6. 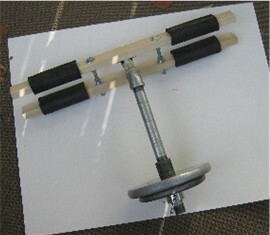 Assemble the weight bar as shown. 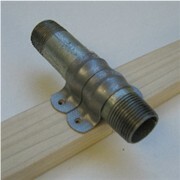 Beginning at one end; cap, 5" length, 45 degree elbow, 8" length, straight connector, 4" length. If you have a pipe wrench, that's good, but these pieces don't have to be screwed together super tight. Mount the weight bar to the underside of the top board using four round head 8 X 5/8 wood screws so that the cap is up against the edge of the board. If you have deemed one side of the board or the other to be a front end, make sure you mount the weight bar accordingly. Actually, this step might be better to perform after the next step. But since I had already done it and taken the picture, here it sits. 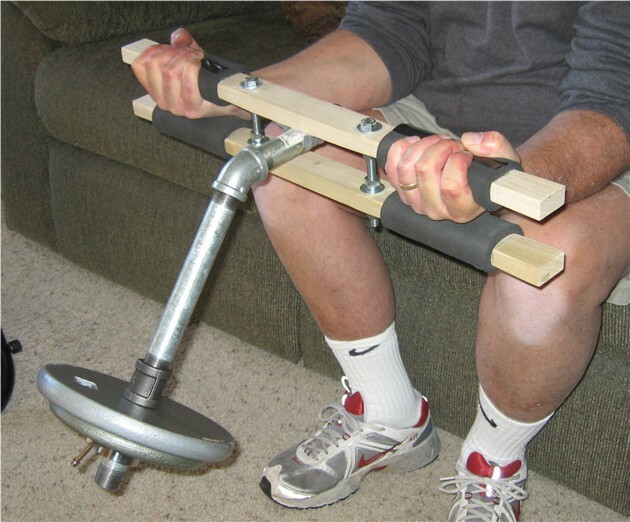 Note: I am pretty certain that the four wood screws screwed securely into hardwood will be sufficient to hold any amount of weight I may use (this device requires about 15-20% of the weight used in a barbell wrist curl). However, if I have any problems with this, I'll simply remove the wood screws and drill the holes through for bolts. Why didn't I do that in the first place? I really think this setup is strong enough. 7. 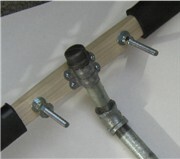 Slip a washer onto each of the two 3/8" bolts and push them through the two drilled holes as shown. On each bolt, add a washer and a stop nut. Using two wrenches, or a wrench and a socket wrench, screw the nuts (Nuts 'A') onto the bolts until they and the washers meet the underside of the board. Do not tighten. Now add another set of nuts (Nuts 'B') and screw up about two thirds the way up the bolts. Add a washer to each bolt. 8. Align the holes in the bottom board with the ends of the bolts and push the board onto the bolts until there is about an inch of bolts protruding through. 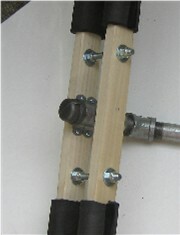 Slip washers and nuts (Nuts 'C') over the ends of the bolts and screw them on until they meet the board. Now, stick your hands through, palms up, grab hold of a couple of handles and see how it feels. Adjust Nuts 'C' up or down until the rubber pads are bracing against the backs of your hands hard enough to be comfortably holding the device in place. Make sure that Nuts 'C' are positioned at the same places on each of the bolts. You can measure the distances between the boards at each bolt. Once you're confident that everything feels right, screw Nuts 'A' tightly against the top board and then screw Nuts 'B' tightly against the bottom board. From there you can fine-tune the device, adjusting the screws as and when you see fit. Now load 'er up and burn yer forearms!